Product and ordering information for Lab Rat Gear. Show your RATitude with your very own BrandTech® Lab Rat Gear: T-shirts, playing cards, magnets and a downloadable calendar. 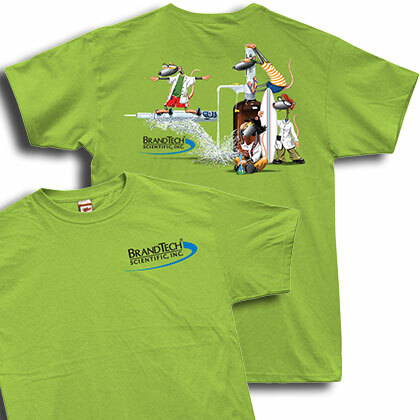 Be the coolest Rat in the lab with the BrandTech® Surf T-Shirt in Teal. 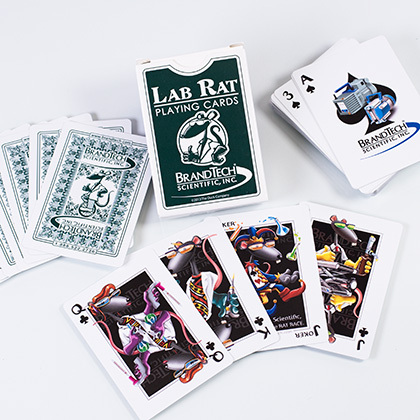 BrandTech® is your Ace in the Rat Race!™ Bring your card playing to a whole new level with the BrandTech® playing cards, where Lab Rats are Kings. The 2018 BrandTech® Lab Rat calendar and ‘Proper Pipetting Procedures’ from the Lab Rats (8.5 x 11). Click here to download. Lab Rat gear is available for purchase or for FREE with qualifying lab product purchases. See the promotions page for details!